Fairly certain I'm the one going crazy...I found myself tying carp flies tonight. 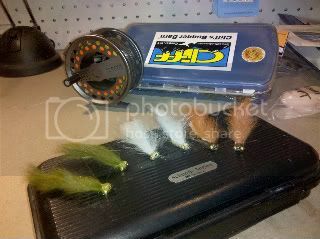 6 Crazy Carpers in assorted colors for an up coming adventure on the St Clair River Delta. The largest freshwater river delta in the world. The crazy carper is a simple tie, a little dubbing, some flash, eyes, and a strip of some poor rabbit's rear end. I'll also be prepared with an assortment of leech and minnow flies. With a little luck, we should be seeing some "Golden Bone" pics here reel soon. Nice looking flies, but I'm really looking forward to some good pics of some huge "golden bones"...Good luck on the those bad boys! That's my old stomping grounds. As a last resort (a little cheating too) I hear a kernal of corn works wonders. Thanks Rexman! I hope we can find some fish out there...its big water. This will be my first carp on the fly. Tight Lines! Hahaha...."Golden Bones" is a hilarious term for those nasty suckers. Did you get the carp to chase these flies? Dirty told me y'all needed a ladder in the boat to spot 'em, then cast at 'em. Good luck putting a step ladder in the gambler!